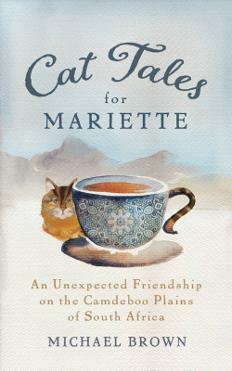 Set in the dusty Karoo semi-desert town of Aberdeen, South Africa, Cat Tales for Mariette tells of the unexpected friendship between Michael Brown and Mariette Van Wyk. Michael narrates the story of how he is coerced by a well-meaning local to visit one of the town's residents who is dying of cancer in the local hospital. Michael reluctantly agrees to a one-time visit, which becomes daily. Within the sterile clinical environment and strained emotional circumstances, the two discover not only friendship, but that each has something important for the other. As his visits unfold, the two bond over tea, cookies and Michael's sharing of his numerous life-changing personal encounters with cats. The telling of these cat stories gently brings resolution to aspects of both their pasts, as well as comfort and insight to Mariette as she faces death.